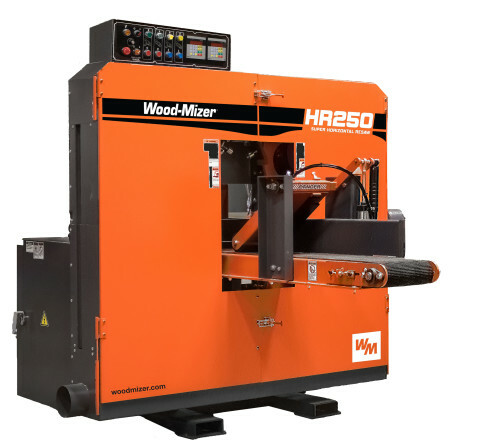 Designed to be a compact and versatile machine that easily integrates into your operation, the HR250 Super twin horizontal band resaw can make one or two cuts in a single pass to resaw cants and boards. Powered by two 20HP (15kW) saw wheel motors and two 2HP (.75kW) gear box motors, the HR250 Super is built to last with heavy-duty construction, premium components, and 28" (710mm) diameter dynamically balanced steel band wheels. 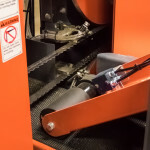 Equipped with a Performance Package, the digital setworks ensure accurate height positioning of the saw wheels and a rugged electric driven conveyor belt features a powered hold down roller to keep material secure through the machine. Blade speed is variable to accommodate various cutting requirements and the variable feed speed is controlled by an electric motor for added efficiency. 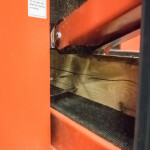 The blade tension is automatic and controlled by an air-over-oil hydraulic system in order to maintain proper tensioning for longer blade life. 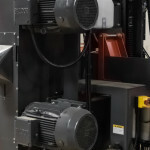 Electric motor drives variable feed speed from 16 to 82 feet/min. 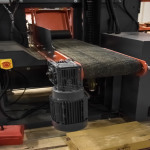 In a single pass, make one or two horizontal cuts to resaw cants and boards within a compact saw head. The frame and conveyor each ship on a single pallet and are setup in 2-4 hours. 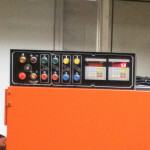 Centralized control panel that features two digital position controls for added convenience when setting cut thickness and displays measurements in either imperial or metric. 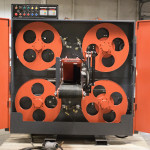 Top and bottom saw wheels are driven by two individual 20HP motors for heavy cutting requirements. 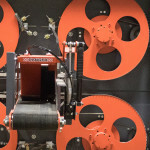 Setworks ensure accurate height positioning of saw wheels with infinitely adjustable upper blade from .78" to 6 ¾" from conveyor table and lower blade from 0.197" to 4.33" from conveyor. Hydraulic cylinder is applied for controlling the blade tension in order to maintain proper tensioning for longer blade life. Packing Dimensions Frame 86" x 45" x 83"
Packing Dimensions Conveyor 113" x 25.25" x 24"